Making the leap from short fiction to novels can be a terrifying, thrilling adventure. And no matter if you’re a new short-story writer or a short-fiction mastermind, it’s guaranteed that writing a full-length novel will require a different set of skills. For one thing, there’s just so much stuff in a novel. Where does all this stuff come from? There’s often more worldbuilding, more characters, and crunchier plot twists. Charlie Jane Anders, who used to just write short stories, will walk you through some ideas for activating your novel-writing brain. 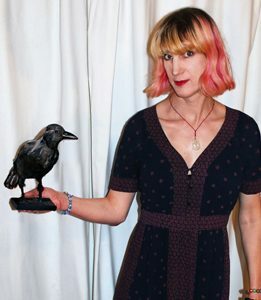 Charlie Jane Anders is the author of All the Birds in the Sky, which won a Nebula Award and a Crawford Award and has been shortlisted for the Hugo and Locus Awards. She organizes the Writers With Drinks reading series, and was a founding editor of io9.com. Her story “Six Months, Three Days” won a Hugo Award, and her debut novel Choir Boy won a Lambda Literary Award. Locus Writers Workshops: Locus has been co-running a writing workshop in Seattle around the Locus Awards Weekend for the past few years and is excited to bring the class to the Bay Area. Past instructors include Gail Carriger, Christopher Barzak, Daryl Gregory, Stephen Graham Jones, Paul Park, and Connie Willis.